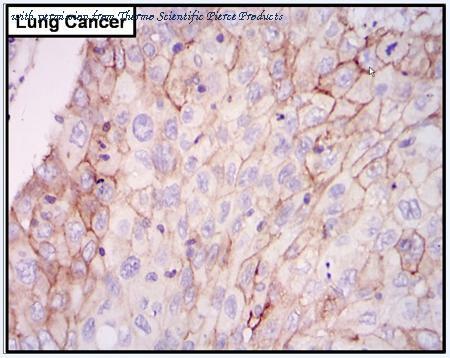 Immunohistochemistry was performed on cancer biopsies of deparaffinized human Lung cancer tissue. To expose target proteins high pressure heat induced antigen retrieval was performed using 10mM sodium citrate (pH6.0) buffer for 20 minutes. Following antigen retrieval endogenous peroxidase activity was quenched with 3% hydrogen peroxide for 10 minutes at room-temp. Tissues were then washed in PBS and blocked in 10% normal goat serum for 20 minutes at room temperature. Tissues were probed at a dilution of 1:200 with a rabbit polyclonal antibody recognizing EGFR (Product # PA1-1110) overnight at 4°C in a humidified chamber. Tissues were washed extensively with PBS. Colorimetric detection was performed using metal enhanced DAB. Image is displayed at 40X magnification. Results demonstrate strong membranous localization of EGFR. Immunofluorescent analysis of EGFR (green) in untreated HeLa cells. 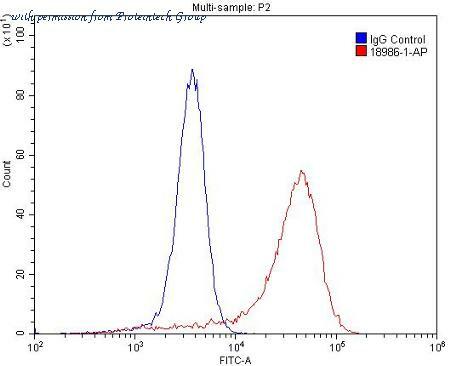 Formalin fixed cells were permeabilized with 0.1% Triton X-100 in TBS for 15 minutes at room temperature. Cells were then blocked with 5% normal goat serum (Product #31873) for 15 minutes at room temperature. Cells were probed with a rabbit polyclonal antibody recognizing EGFR (Product # PA1-1110), at a dilution of 1:500 for at least 1 hour at room temperature. Cells were washed with PBS and incubated with DyLight 488 goat-anti-rabbit secondary antibody at a dilution of 1:400 for 30 minutes at room temperature. 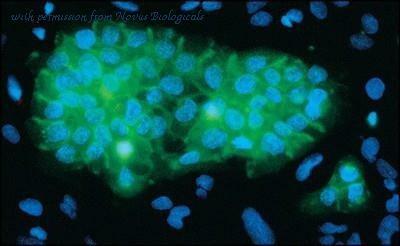 Nuclei were stained with Hoechst 33342 dye (Product# 62249). Images were taken on a Thermo Scientific ArrayScan at 20X magnification. 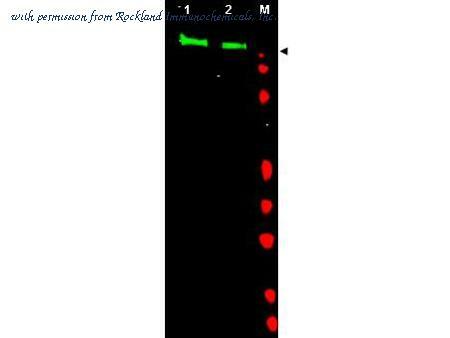 Western blot detection of EGFR from human HeLa cells using PA1-1110. 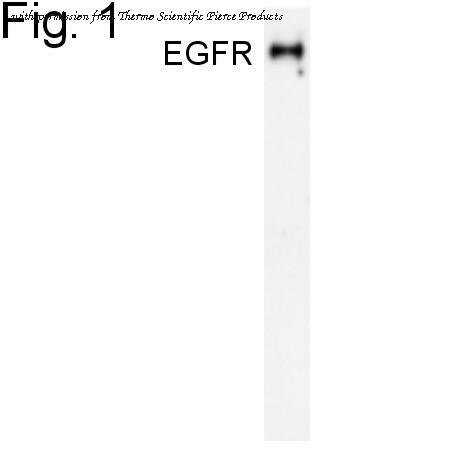 Western blot analysis of EGFR (pTyr1068) using A431 cell extracts treated with EGF. Lane 1: Molecular Weight Markers, Lane 2: A431, Lane 3: A431 + EGF.